But now you even don’t need to journey to the green land, because Microgaming group gives you inimitable chance to follow the rainbow in no download format! 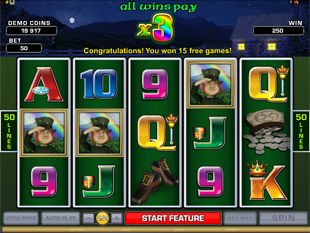 Launch Lucky Leprechaun’s Loot Slots Machine to try your luck spinning 5 reels and exploring 50 paylines. Just go for it and win Free Spins or grab 10,000 coin prize right now! Sparkling, valuable and precious… Gold Coin is one of the most desired things and also a wild symbol. This small thing has lots of power over people and symbols as well. 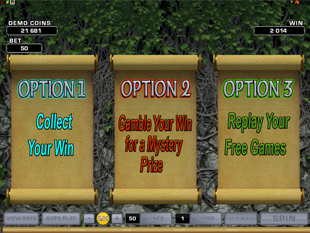 Thus, Gold Coin has might to substitute for any other icon of the slot and in the way complete winning combos. But it’s not all about the wild Coin to notice. The further info is bound to change your life… Gold Coin is a wild multiplier that will double each win when replacing. Yeah! Leprechaun is a fab creature that lives on the reels and can make your dreams come true. But, what is more, it is a scatter symbol that can boost your wealth without building combos and nevertheless activated paylines. We recommend you to watch out and catch 2, 3, 4 or 5 nasty gnomes in the green tights to multiply your total bet by 2, 5, 20 or 500 times respectively! But if you’re eager to find the way to the heaps of gold and win Free Games then you need to catch at least 3 dwarfs. Want to get into the reel fairytale? It’s easy to do. First and foremost, you need to choose the coin value from the range $0.01, $0.02, $0.05 and $0.10. Then place up to 10 coins of the definite size per line activated. As you see, it’s you to be a reel story-taller, thus, it’s only up to you to choose how much to set. However, if you come here to find the biggest treasures then you are to risk. Only the highest stake that is $50 per spin gives you the chance to win the most emarlad jackpot of 10,000 coins. So, play the max bet and try to hit 5 Pot of Gold symbols on the payline to seize $1,000 prize. Rainy clouds in the sky? It’s high time to start your hunting for scatter Leprechauns! Just manage to catch 3, 4 or 5 fab dwarfs anywhere on the reels and you will be awarded with 15, 20 or 25 Free Spins accordingly! It’s your lucky chance to grab as much more gold coins for FREE! It’s easy with the wild Gold Coin that turns to be 6x Multiplier! Use it wisely and become a reel rich-man. Moreover, the feature can last forever. Yep. For that you just need to hit 3 or more scatters again within your Free Games last. Remember that you can pick only one option awarded. Besides, options 2 and 3 forfeit all gold coins you won during the Free Games. So, think twice before you make a decision. Love Ireland and its legends? 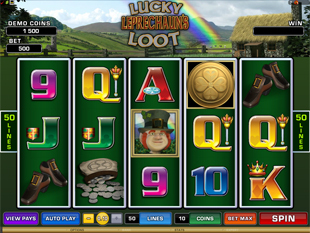 Lucky Leprechaun’s Loot slot is what you need to try! 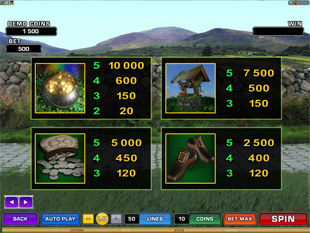 Plus there is one more game to appreciate… Improve your fortune spinning the reels of Irish Eyes slot as well. Just try both games and choose the best for you.